In London, on August 26, 1718. Emanuel Davisson was born in 1692, probably in Danzig (Gdańsk). In 1707 he studied in the high school of Danzig, from 1711 in Königsberg, and presumably also in the Netherlands. After returning home he practised in Danzig. He refuted (1724) the idea that the plica polonica (“Polish curl”, the knottying of the hair accompanied by skin symptoms, caused by lousiness) was an illness. He died in 1743. His dissertation defended in Königsberg in 1711 was published in print: Disputatio politica de imperio hominis in hominem naturali, quam … praeside M. Georgio Thegen … suscipit Emanuel Davisson. Regiomontum, 1711. 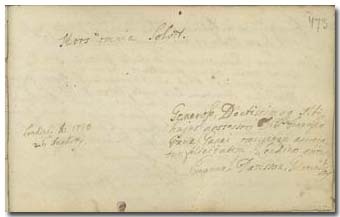 Davisson wrote in the album of Pápai Páriz shortly before leaving from London (Londino abiturus), in August of 1718. He had probably paid a visit to England from the Netherlands. Why does a physician choose for motto just this: Death resolves everything?